King Nutrition is formulated by a natural triglyceride marine lipid concentrate fortified with Lecithin, Garlic Oil, Royal Jelly providing a dietary source of Omega 3 polyunsaturates. King Nutrition is formulated by a natural triglyceride marine lipid concentrate fortified with Lecithin, Garlic Oil, Royal Jelly providing a dietary source of Omega 3 polyunsaturates. This product contains no starch, sugar, artificial preservatives and no chemical additives. 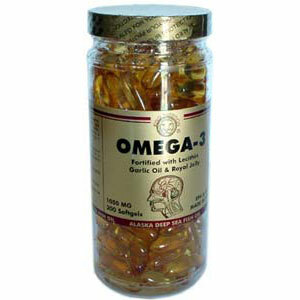 Concentrated deep sea fish oil, with Lecithin, Garlic Oil, Royal Jelly, Gelatin, Glycerin, Purified water, D-alpha Tocopherol. As a dietary supplement for senior, take two capsules a day.